Plant Description: An evergreen tree of the magnolia family that ranges from small to medium, growing up to 8m (26ft) in height. The axillary flowers are yellow and the leaves are lanceolate. The fruits of this tree are harvested before they are ripe and are then sun dried. The fruit is star shaped and radiates between five and ten pointed boat shaped sections. There are an average of eight sections. Each section is hard, with tough skin and a rusty color, and is also a seedpod. Each section measures up to 3 cm (1-1/4") long. Aromatic Fragrance: powerful and licorice-like scent. Storage Directions: Essential Oils should be stored in a cool dry place out of direct sunlight. Essential Oils should be stored in colored glass, the most common storage method being used today are Boston Round Bottles in the amber tint. Blends Well With: : Pine, orange, clove, rosewood, cinnamon and lavender. Cautions: nise Star from China is generally considered non-toxic and non-irritating. 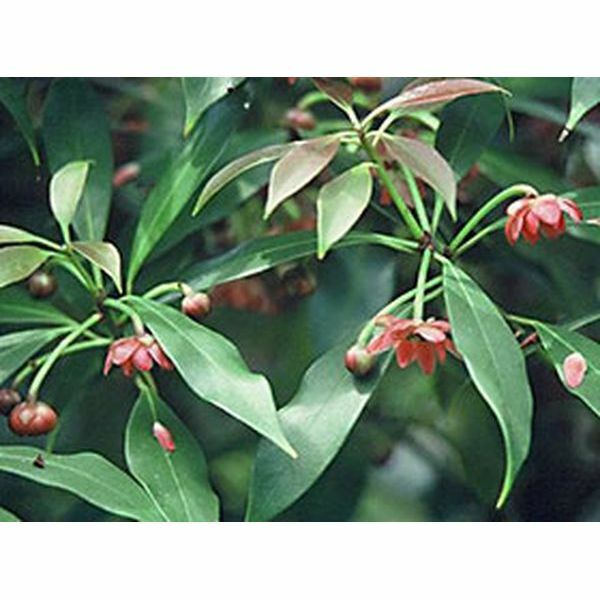 This is unlike Illicium anisatum which is the Japanese variety that is long considered to be toxic. For external use only. I got this scent to use with peppermint for a warm Christmas candy-type scent. I also love the idea of using it on its own for a hunter soap. This scent is very strong, so a little goes a long way. Has a strong licorice smell, not sure if I will repurchase this oil. I wasn't sure about this when I ordered it but it is really a great scent. I think I'll use it often in the fall & winter for lotions & scrubs. Another great find! Not only is anise a great fall fragrance but it is popular with my customers this time of year due to it's use as a human scent cover for hunters. Also great for spicy harvest season blends, but right now most of my customers are buying this because there are so many hunters in the north country.